When I moved in to my parents’ house, I had no furniture. I had lived for several years in a travel trailer where everything was built-in. 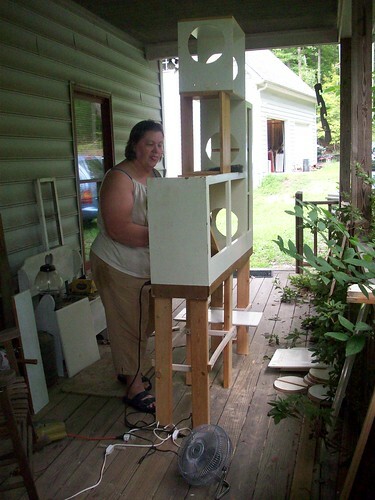 Since Mother Dearest has collected furniture for years she already had a bed and a futon and chairs and tables, that sort of thing, and I had … a small fridge and several sets of the wire cubes that you connect with little plastic connectors. 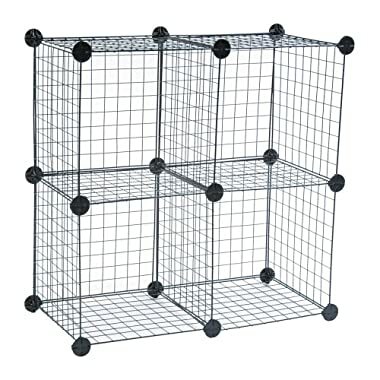 These guys are awesome for small spaces; you can put them together and take them apart as needed without a big hassle and they take up almost no room when broken down. 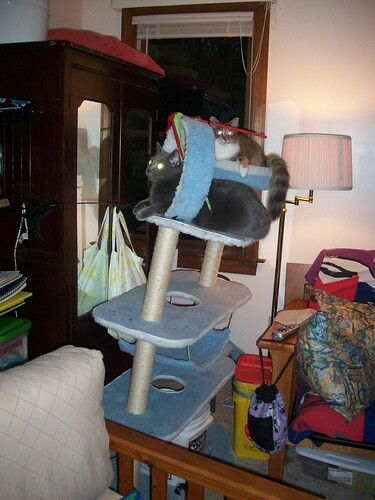 I had a cat climbing tower as well, a little one that was about four feet tall and worked fine in a small space when the kittens were little, but as they got bigger it became clear that it was not going to work. There were some structural integrity issues. So I decided to build a new one. 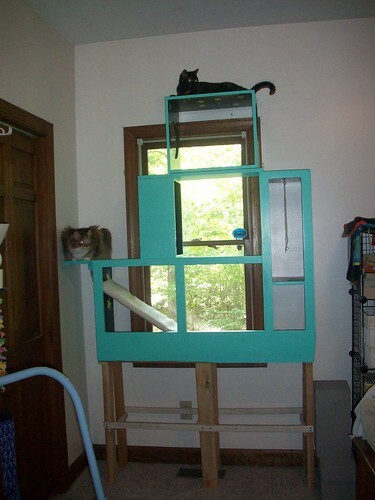 It would have to modular, made from reasonably priced materials, accommodate around forty-five pounds of assorted cats, and be something I could do with my limited woodworking skills. It would also have to fit in a wide but shallow space in front of a window and beside a closet door. This served as the base for the castle. It's a kitchen cabinet and cost fifteen dollars. 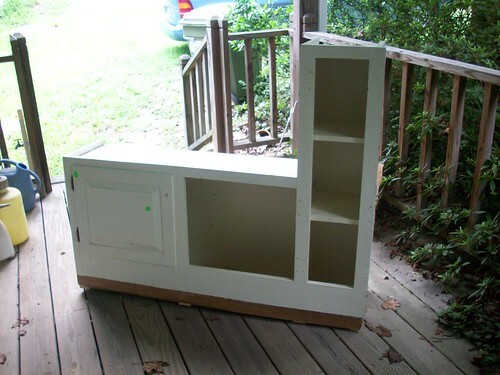 For those who are wondering how that thing could possibly be a kitchen cabinet, you should know that it’s upside down. It was originally mounted over a sink and the tall part on the right would be on the left of the sink. It had the primary requirement of being narrow, the castle had to fit against a wall and still allow a closet door to open. 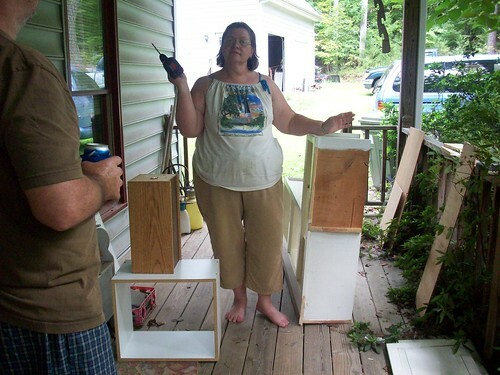 We snagged a few loose drawers as well, one for two dollars and one for three, and headed home to modify my new purchases. Thank goodness for Mother Dearest and her power tools. Mother Dearest has forbidden me from posting any more pictures of her on Facebook. But we're not on Facebook, are we? 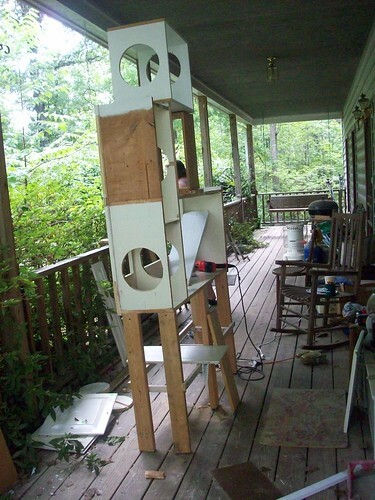 There was much figuring done and then the sawing of holes and scrap lumber was found to make legs that would raise the whole thing to window height. Fast forward to the final fitting to make sure all the holes are in the right place and everything fits. Mother Dearest is being gracious as always. Backside view with all the pieces in place. Mother Dearest got fed up with me taking her picture; she flipped me the bird and retreated to the front steps. The whole thing was brought inside to be painted; bright turquoise on the outside and deep teal that looks almost black with yellow stars on the inside. I originally painted the inside yellow, ironed on butcher paper stars, painted around them, and took the paper stars off. it looked horrible so I had to go back and paint over the yellow areas with the dark teal. Instead I cut even more stars out of yellow paper and decoupaged them to the inside. Trying to paint something this big in a house full of cats who live to find new and interesting places to sleep proved to be quite a challenge. At least I knew they would actually use it. I covered the ramp leading from the bottom to what became the middle tier with burlap so it could be used as a scratching board as well. I made the decision to leave the legs unpainted and rubbed them with catnip oil. The rear ones have become Simon’s favorite scratching posts. I had lots of “help”. 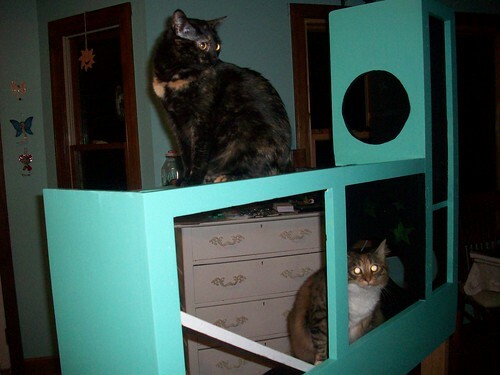 They were absolutely thrilled when it was moved to its final place. The final pieces, the two drawers and a little landing on the left by the portal leading from the bottom to the middle, were added about a week later. They were thrilled all over again. It was like it was a new castle. Thank you for spending so much time and energy making a nice high place for us. Now go away. Awesome castle. 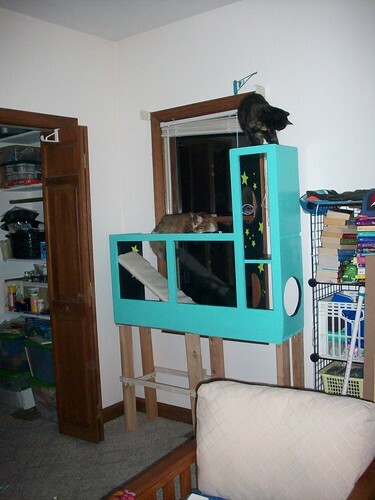 My cats would love it but we have no place to put such a monstrosity. It’s pretty big but it’s using a spot that would have otherwise gone to waste, since the only thing that would have been narrow enough to fit there would have been a bookcase, which would have blocked all or part of the window and the air vent underneath. 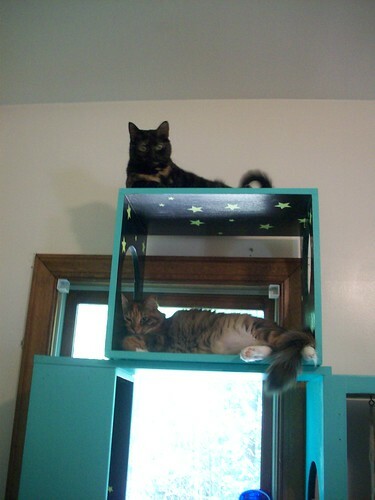 The cats love it and prefer it over most of the other furniture in the house. Cool. My cats’ favorite piece of furniture is me. 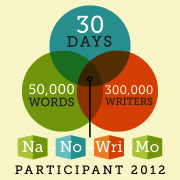 That’s a lot of awesome right there!